I’ve really got into combining sweet and savoury flavours recently, and I thought I’d use these as a basis for creating a dish for Meat-free Monday. 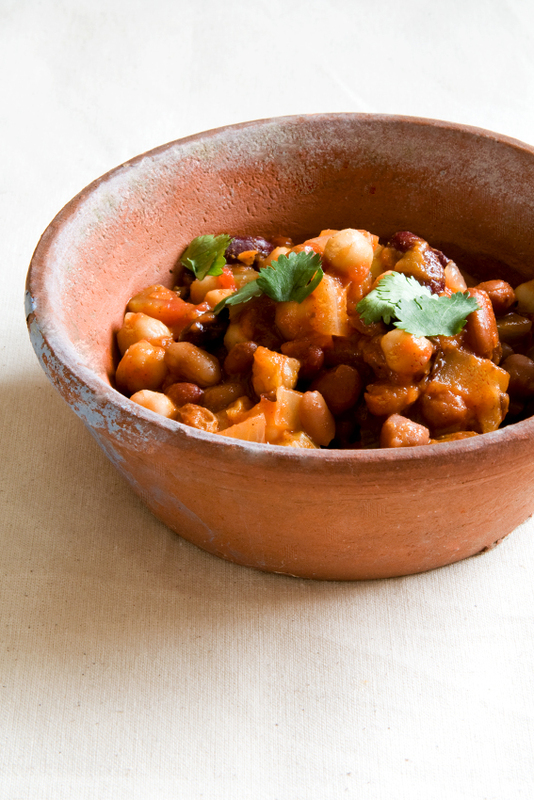 This is a Moroccan-inspired bean stew, healthy, tasty and incredibly simple to prepare. I made sure to make plenty so there was enough left for lunch the next day. I really wanted to try making flat breads but ran out of time, so I served the stew with toasted wholemeal pittas and a yogurt dip. 1. )Heat the oil in a large pan. Add your onion and allow to soften before adding your garlic, carrots, cumin, ginger, paprika, cinnamon, chilli and coriander. Cook for about 3 minutes. 2. )Add your beans, tomatoes, tomato puree, sultanas, apricots and half a tin of fresh water. Stir gently to combine all the ingredients together. 3. )Leave on a gentle simmer, stirring occasionally, for about 30 mins to allow the stew to cook down. mmm, can just imagine how good this tastes. Shame about the flat breads which I can’t stop making. This is relly my kind of stew and I love that you’ve served it in a rustic bowl too. Good luck with the flatbread making in the future. I chanced upon your blog and guess what? My blog is also named Breakfast by the Sea! haha except it’s on posterous. How funny that our blogs have the same name – we clearly share excellent taste!